The problem with Stemcell’s handheld magnets, used by researchers to separate red blood cells, was keeping them clean. They were constructed of several parts and material tended to accumulate in crevices and risk corroding the magnet. The company wanted to solve the problem but had never worked with industrial designers before and were concerned about making a seemingly simple product even more expensive to produce. Low volume manufacturing requirements limited the choices of cost-effective manufacturing technologies we could use for such a small production. The goal was to design an inexpensive housing that would be easy to clean, attractive and ideally suited for a low production volume. The solution began by exploring the use of various fabrication techniques and tabulating costs associated with tooling, fabrication, materials, and assembly time for each of these options. One of the options we investigated considered a simpler magnet construction which would then be potted into machined enclosures. This provided an extremely durable & easy to clean finish and eliminated the need for a label by laser etching graphics into the aluminum. The final design reduced the overall cost by a dramatic 40% and because of it’s success, became the clear choice for other Stemcell separation units. 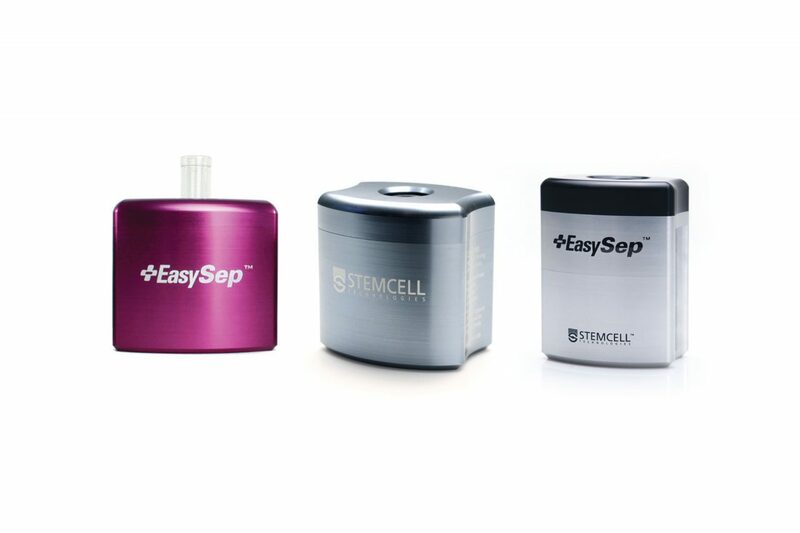 Stemvision and Robosep enclosures were designed with a view to address functional criteria of these automated devices while maintaining a consistent overall visual brand associated with Stemcell products. Modular stands were developed to facilitate manual dispensing of multiple magnets.